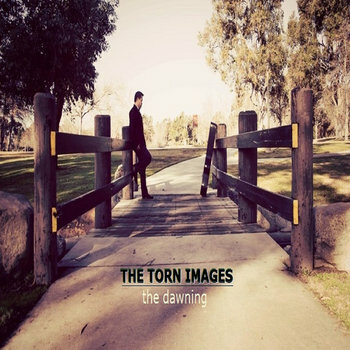 In that they formed in May of 2012, The Torn Images is still a brand new name in the music scene. Like the budding band itself, their songs are fresh, though they have a vintage feel to them at the same time. The Dawning, a fitting title for this two-man band's first release, is an EP consisting of six tracks. Though the group is made up of only two men, Briand Arabaca and Jayson Thompson, you wouldn't guess that from the music itself. Their sound is based around rock elements, but with the help of producer Jonathan O'Brien and sound engineer Tyler De Young they are able to produce rich, layered compositions that contain a range of additional sounds which allow their music to dabble here and there in electronic subgenres. "Scent of Summer" follows a similar progressive rock style as Muse and kicks off the album. Rock is merged with electronic and progressive styles in this piece; in turn, this blend leads to the conception of ambient, almost other-worldly sounds - a style many refer to as space rock. "Path of Resolution," on the other hand, has a more vintage, British rock tone to it as does "Healed Memory." As these tracks start to take on a more retro sound the group begins to reflect a style similar to Echo and the Bunnymen or The Church. Reflective, introspective lyrics that question the solitude and isolation the world can create seem to be a common theme as the EP continues to unfold. Arabaca begs to the heavens in "Path of Resolution" to be gifted with forgiveness, redemption, and resolution. But while the lyrics are so detailed they still have a way of coming across with some vagueness, leaving a good deal of ambiguous conclusions to be formed. The keyboard adds an additional layer to the track that lends to the lyrics, creating a feeling of calmness and serenity. Melancholy lyrics, especially when love is the topic, seem to be another common topic on this album. But there are times where the tracks turn around, becoming optimistic, such as with "The Sun and the Downfall." The first verse and first chorus are more pessimistic; Arabaca sings in first person about how he decided to close the door on love. The following verse and chorus, however, find a different light. He begins with, "And you appeared like the sun, beamed and shined with rays of hope." The lyrics of the chorus have also been completely altered and rearranged in order to fit his new outlook. Though "Scent of Summer" is the group's first single, "Heart of Stone" is probably the most notable track on the album and would do well as the next single seen from the band. With an 80's energetic pop style to it, you cannot help but to let it win your heart over. The keyboard takes center stage while the drums lay down a steady pattern for the extent of the song. The final track is "Music Is My Therapy," which recognizes how powerfully music is able to effect a person. A heavy drum pattern acts as the key instrument while the keyboard follows in the background to provide the track with electronic characteristics. The one main downfall to the album is that the lyrics can sometimes become difficult to understand with Arabaca's accent. All things considered, The Dawning manages to maintain a retro vibe about it while also sustaining a distinct diversity. They do this by transcending both multiple genres as well as multiple eras with their sound, allowing their fan base to extend through various genres and age groups also. Alec Cunningham is a journalist and freelance writer from Knoxville, TN. Her passion for music goes back to the early days of her youth. For her, having the chance to interview bands and review their music, along with becoming introduced to new artists, combines the best of the music and writing worlds. She currently works for the Music section of BLANK Newspaper, Knoxville’s longest-running independent publication, writing musician interview articles and album reviews.